James Beeland Rogers, Jr. is an American investor and author based in Singapore. He is chairman of Rogers Holdings and Beeland Interests, Inc. He was the co-founder of the Quantum Fund with George Soros and creator of the Rogers International Commodities Index (RICI). Rogers is an outspoken proponent of the free market, but he does not consider himself a member of any school of thought. Rogers acknowledged, however, that his views best fit the label of Austrian School of economics. After attending Yale and Oxford University, Jim Rogers co-founded the Quantum Fund, a global-investment partnership. During the next 10 years, the portfolio gained 4200%, while the S&P rose less than 50%. Rogers then decided to retire – at age 37. 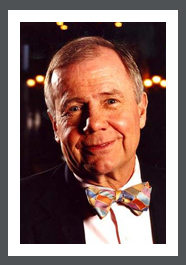 Continuing to manage his own portfolio, Jim Rogers kept busy serving as a professor of finance at the Columbia University Graduate School of Business, and, in 1989 and 1990, as the moderator of WCBS’s ‘The Dreyfus Roundtable’ and FNN’s ‘The Profit Motive with Jim Rogers’. In 1990-1992, Jim Rogers fulfilled his lifelong dream: motorcycling 100,000 miles across six continents, a feat that landed him in the Guinness Book of World Records. As a private investor, he constantly analyzed the countries through which he traveled for investment ideas. He chronicled his one-of-a-kind journey in Investment Biker: On the Road with Jim Rogers. Jim also embarked on a Millennium Adventure. He traveled for 1101 days on his round-the-world, Guinness World Record journey. Passing through 116 countries, he covered more than 245,000 kilometers, which he recounted in his book Adventure Capitalist: The Ultimate Road Trip. His latest book “A Gift to My Children: A Father’s Lessons for Life and Investing” was published in 2009.